Pullover in a range of sizes, with an interesting plaid effect made by slipping stitches. The instructions are given in 9 sizes with smallest size given first and the larger sizes in brackets. Using No 10 (3¼mm) needles and yarn B standard (smooth) double knitting yarn cast on 93 [99; 105; 111; 115; 121; 127; 133; 137] stitches. 1st row (right side): K1, * p1, k1; repeat from * to end. 2nd row: p1, * k1, p1; repeat from * to end..
Repeat these rows 9 times more. Change to No 8 (4mm) needles and commence pattern. 2nd row: Knit 6 [9; -; 4; 6; 9; -; 4; 6], * [purl next stitch winding yarn 3 times round needle, k2] twice, k5; repeat from * to last 10 [13; -; 8; 10; 13; -; 8; 10], stitches, [purl next stitch winding yarn 3 times round needle, k2] twice, knit to end. 3rd row: Change to No 9 (3¾mm) needles and yarn A bouclé, p6 [9; -; 4; 6; 9; -; 4; 6], * [yb, slip 1 purlwise, allowing the extra loops from previous row to fall, p2] twice, p5; repeat from * to last 10 [13; -; 8; 10; 13; -; 8; 10], stitches, [yb, slip 1 purlwise, allowing the extra loops to fall, p2] twice, purl to end. 4th row: Knit 6 [9; -; 4; 6; 9; -; 4; 6], * [bring yarn to front of work, slip l purlwise, k2] twice, k5; repeat from * to last 10 [13; -; 8; 10; 13; -; 8; 10], stitches, [bring yarn to front of work, slip l purlwise, k2] twice, knit to end. 5th row: Purl 6 [9; -; 4; 6; 9; -; 4; 6], * [yb, slip l purlwise, p2] twice, p5; repeat from * to last 10 [13; -; 8; 10; 13; -; 8; 10], stitches; [yb, slip l purlwise, p2] twice, purl to end. 6th row: As 4th row. 2nd row: K4, purl next stitch winding yarn 3 times round needle, k7, * [purl next stitch winding yarn 3 times round needle, k2] twice, k5; repeat from * to last 5 stitches, purl next stitch, winding yarn 3 times round needle, k4. 3rd row: Change to No 9 (3¾mm) needles and yarn A bouclé, p4,yb, slip 1 purlwise, allowing the extra loops from previous row to fall, p7, * [yb, slip 1 purlwise, allowing the extra loops to fall, p2] twice, p5; repeat from * to last 5 stitches, yb, slip 1 purlwise, allowing the extra loops to fall, p4. 4th row: Knit 4, bring yarn to front of work, slip l purlwise, k7 * [bring yarn to front of work, slip l purlwise, k2] twice, k5; repeat from * to last 5 stitches, bring yarn to front of work, slip l purlwise, k4. 5th row: Purl 4, yb, slip l purlwise, p7 * [yb, slip l purlwise, p2] twice, p5; repeat from * to last 5 stitches; yb, slip l purlwise, p4. ....until work measures 14 [14½; 14½; 15; 15; 15½; 15½; 16; 16] inches from the beginning , ending with a wrong side row. Keeping continuity of pattern, cast off 7 [7; 8; 8; 8; 8; 9; 10; 10] stitches at the beginning of the next 2 rows. Decrease 1 stitch at each end of the next and every following alternate row until 69 [75; 79; 83; 87; 91; 95; 99; 101] stitches remain. Continue without further shaping until work measures 8¼ [8½; 8¾; 9; 9¼; 9½; 9¾; 10; 10¼] inches from the commencement of the armhole shaping, ending with a wrong side row. Cast off 7 [7; 8; 8; 8; 9; 10; 10; 10] stitches at the beginning of the next 4 rows, and 6 [8; 7; 9; 8; 10; 9; 10; 10] stitches at the beginning of the following 2 rows. Leave the remaining 29 [31; 33; 33; 35; 35; 37; 39; 41] stitches on a spare needle or stitch holder. Work as given for back from  to  until work measures 8 rows less than the Back to armhole shapings ending with a wrong side row. Next row (right side facing): Pattern , 43 [46; 49; 52; 54; 57; 60; 63; 65], p2tog, p1. Turn, and leave the remaining stitches on a spare needle or stitch holder. Next row: Pattern to last 3 stitches, p2tog, p1. Next row: cast off 7 [7; 8; 8; 8; 8; 9; 10; 10] stitches; pattern to last 9 stitches, p2tog, pattern to end. Next row: Pattern to end. Next row: Work 2 together, pattern to end. Continue to decrease in this way at the neck edge on every 4th row, and at the same time, decrease 1 stitch at the armhole edge on every alternate row until there are 29 [32; 34; 35; 37; 39; 41; 43; 43] stitches remaining. Keeping side edge straight, decrease at neck edge as before until 20 [22; 23; 25; 26; 28; 29; 30; 30] stitches remain. Continue without further shaping until work measures the same as the Back to shoulder shaping, ending at the side edge. Cast off 7 [7; 8; 8; 9; 9; 10; 10; 10] stitches at the beginning of the next and following alternate row. Cast off remaining 6 [8; 7; 9; 8; 10; 9; 10; 10] stitches. Return to the stitches on the spare needle on the other half of the front. Slip the centre stitch onto a safety pin. Next row: Joining in yarn at the neck edge to the remaining stitches, p1, p2tog, pattern to end. Next row:P1, p2tog, pattern to end. Next row: Pattern 7, p2tog, pattern to end. Next row: cast off 7 [7; 8; 8; 8; 8; 9; 10; 10] stitches; pattern to end. Next row: Pattern to last 2 stitches, work 2 together. Next row: Pattern 7, work 2 together, pattern to last 2 stitches, work 2 together. Complete to match the first side, working from  to . Using a back stitch and matching yarn, join right shoulder seam. With right side of work facing, using No 10 (3¼ mm) needles and yarn B, pick up and knit 68 [70; 72; 74; 76; 78; 80; 82; 84] stitches down left side of neck, knit centre from safety pin (mark this stitch with a coloured thread or stitch marker), pick up and knit 68 [70; 72; 74; 76; 78; 80; 82; 84] stitches up right side of neck, knit across the 29 [31; 33; 33; 35; 35; 37; 39; 41] stitches of back neck, increasing into last stitch: 167 [173; 179; 183; 189; 193; 199; 205; 211] stitches. left hand needle. Now place stitch on cable needle back onto left hand needle and p3tog; p1/k1 rib to end. 2nd row: Rib to 1 stitch before centre stitch slip next stitch onto right hand needle, slip next stitch onto cable needle and leave at front of work, slip next stitch onto right hand needle. Now place stitch on cable needle back onto left hand needle, then place both stitches on right hand needle back onto left hand needle and k3tog; rib to end. Repeat these 2 rows twice more, then the first row once. Cast off in rib, decreasing on this row as before. Using a back stitch and matching yarn, join left shoulder seam and Neckband. With right side of work facing, using No 10 (3¼ mm) needles and yarn B, pick up and knit 90 [94; 96; 100; 102; 104; 108; 110; 112] stitches evenly along armhole edge. Work 7 rows in k1/p1 rib. Pin out to correct measurements and steam very gently, using a warm iron over a damp cloth. Using matching yarn, join side seams and armbands. A pair each No 10 (3¼mm), No 9 (3¾mm) and No 8 (4mm) needles. Chest to fit: 32 [34; 36; 38; 40; 42; 44; 46; 48] inches. Chest actual: 34 [36; 38; 40; 42; 44; 46; 48; 50] inches. 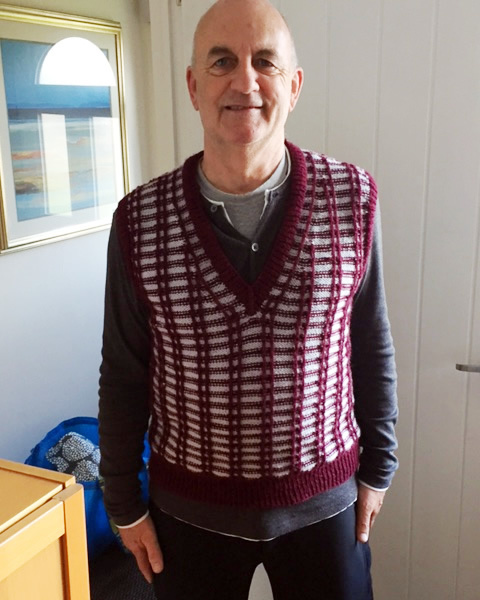 You can see in the picture this is knitted in two different colours and textures of double knitting yarn. Finding a substitute will not be impossible as DK yarns are fairly standard, though it might be trickier to find the bouclé. 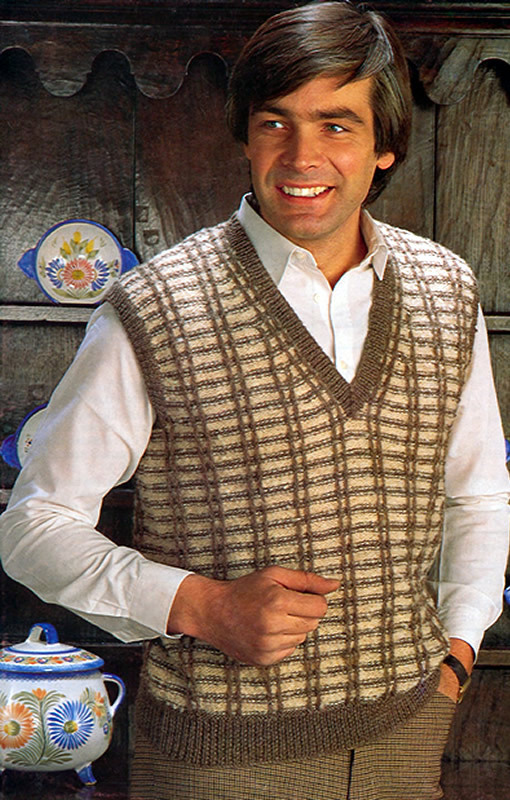 The example shown, used Stylecraft double knitting yarn in just the one texture (no bouclé). It took 125g of the maroon colour and just under 100g of the grey (or silver).